Yesterday evening started very clear, but ended cloudy. Nevertheless I was able to bag several objects: the Lacrosses 2 & 3, the NOSS 3-4 Centaur rocket, GOCE flaring, and the HEO objects USA 179 and USA 184. GOCE (the European Gravity field and steady state Ocean Circulation Explorer) made a zenith pass, zipping close to M31 at mag. +4 to +5 and then flaring briefly to mag. +2 at 17:24:23.15 UTC. It was nice to watch. 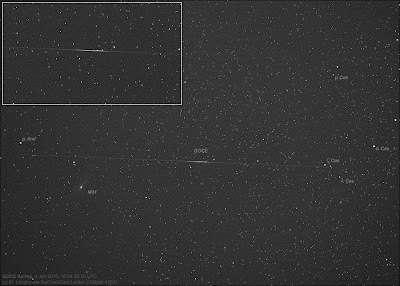 GOCE is in a very low orbit and moves very fast: the flare almost looks like a meteor to the eye. 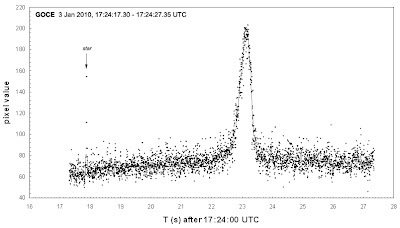 The flare was caused by the 67.5 degree panel and the time yields a flare angle of 93.6 degree and tilt of 51.9 degree. The 93 degree angle is consistent for all GOCE flares I so far observed (theoretically, that angle should be 90 degrees, i.e. at the moment of culmination when the sun-observer-satellite flight direction makes a square angle). 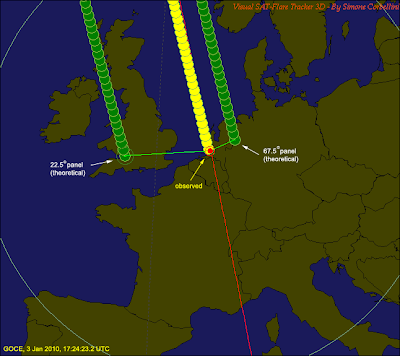 The miss distance to the theoretical central flare path (quite large in this instance: some 175 km!) doesn't really seem to matter with regard to the flare brightness: they always come out at +2 to +3 (even when, as in this case, the tilt is off from 67.5 degree by over 15 degrees). Below is the image, the derived brightness profile (edit - please note that the time stated in the upper left corner of the diagram is wrong: I inadvertently mentioned the end of the exposure here instead of the flare peak time), and the observing geometry. Note how the flare peak is slightly asymmetrical, the descending branch is slightly steeper.